How cute! You all know I'm a dog lover...having two of my own fur babies so as a rule, I watch all dog-related movies. I know, I'm dog-crazy! I should've been a vet instead. My SO always laughs at me...kind of groans, because I'll make him watch all these movies just because they have dogs in them. Yes, I watched a lot of the Buddies movies, even the latest, Spooky Buddies. They were so cute! Anyhow, Frankenweenie has a new poster and it's pretty adorable so I thought I'd share it with you. Frankenweenie hits the big screens October 5th. Still a long ways away, but it's another Tim Burton movie so it's sure to be a hit! This animated comedy stars as the voice cast Catherine O’Hara, Martin Short, Martin Landau, Charlie Tahan, Atticus Shaffer, Robert Capron, Conchata Ferrell and Winona Ryder. We all know the name, Tim Burton, the mastermind behind “Alice in Wonderland” and "The Nightmare Before Christmas”. 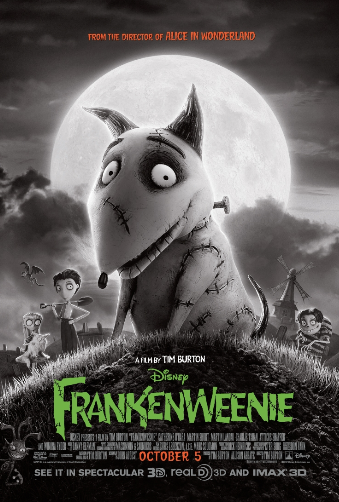 “Frankenweenie” is the newest sensation to hit the big screens and is a heartwarming tale about a boy and his dog. What would you do to bring back a loved pet? After Victor unexpectedly lose his beloved Sparky, Victor turns to science to bring Sparky back to life, but with some minor modifications. The result...Frankenweenie...what happens next? This movie sounds like it'll be pretty cool. It was filmed in black and white and then made 3D. Should be a neat experience! I've never seen black and white films in real life before! 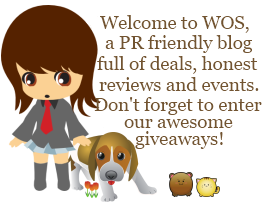 Want to know some fun facts about Frankenweenie and Tim Burton? -When Tim Burton originally conceived the idea for “Frankenweenie,” he envisioned it as a full-length, stop-motion animated film. Due to budget constraints, he instead directed it as a live-action short, released in 1984. -Frankenweenie is produced from a screenplay by John August but based on an original idea by Tim Burton. -Over 200 puppets and sets were created for the film. -The voice cast includes four actors who worked with Burton on previous films: Winona Ryder (“Beetlejuice,” “Edward Scissorhands”), Catherine O’Hara (“Beetlejuice,” “The Nightmare Before Christmas”), Martin Short (“Mars Attacks!”) and Martin Landau (“Ed Wood,” Sleepy Hollow”). -Several of the character names—Victor, Elsa Van Helsing, Edgar “E” Gore and Mr. Burgemeister— were inspired by classic horror films. Yes, you can bet that I'm going to drag the SO to this too. What? It's got dogs in it! Even if it is "Frankenweenie"...mwahahahaha! I hadn't heard about this movie yet... thanks for putting it on my radar!